When it comes to design, styling has to be something very personal to the customer. 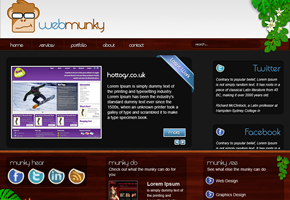 For WebMunky, the site needed something that says “fun”, “young” and “exciting” – but still gave the customer the opportunity to change the development of the site at a future date. 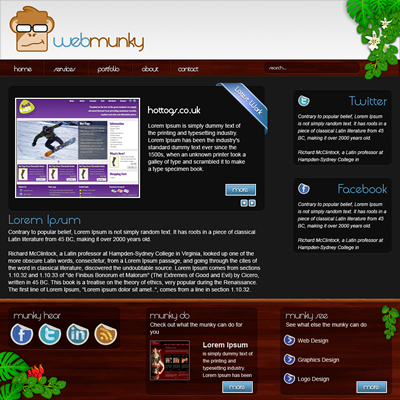 After all, WebMunky is a web developer too! First, I redesigned the site logo from the former grey and white style. Next, I looked at the possibilities for the environment for where a monkey might play; settling on taking inspiration from the jungle. Using this as the base for the style, I created foliage and wooden patterns, and opened up the content area with whitespace – giving the whole layout a clean, fun vibe. And because it’s WordPress-based, the customer has complete control over layout, content, comments and more – accessible from his mobile phone too!